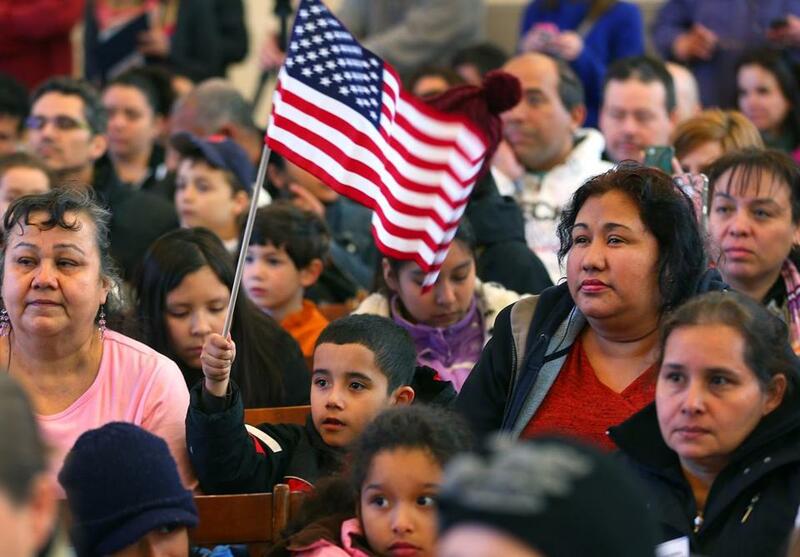 Immigration reform backers packed Faneuil Hall for a rally held as part of national Power up for Citizenship week. Hundreds rallied and marched for immigrant reform in Boston Saturday, their chants bouncing off downtown’s storied brick and stone buildings as they walked from Faneuil Hall toward City Hall. “Si se puede” shouted a trumpeter, joined at the front of the procession by a makeshift brass band, as they led a crowd of more than 700 immigrants, clergy, workers union members, and supporters through some of Boston’s busiest streets early Saturday afternoon. The Faneuil Hall rally and march aimed to pressure Congress to pass comprehensive immigration reform, including a pathway to citizenship for the 11 million foreign-born immigrants living in the country illegally. The rally, organized by local chapters of the Service Employees International Union, Massachusetts Jobs with Justice, and MassUniting, featured speeches from US Senator Elizabeth Warren and Representative Joseph P. Kennedy III, with both Democrats calling for the passage of immigration reform once Congress resumes session following its Easter break. “My Spanish may not be great but it’s coming from the heart,” Warren said with a chuckle that was met with laughs and cheers from the crowds, armed with flags and signs, who packed Faneuil Hall. Moments later, Kennedy led the crowd in chants of “Si se puede” — Cesar Chavez’s motto adopted as a rallying cry by the immigration movement — before launching into a speech, in which he also jumped between English and Spanish, about the country’s need to address its broken immigration system. The rally was part of the ‘‘Power Up for Citizenship,’’ a nationwide initiative launched by immigration reform advocates. One took place in Nashua on Saturday and another is planned in Providence on Sunday. Without a pathway to citizenship, immigrants who are facing health problems or domestic violence are incapable of seeking help, said Dora Orellana, who said she lived with an abusive husband for six years because she feared that reporting him to authorities would lead to her deportation. “I was terrified they would take my children,” she said. Orellana said that, despite her fear of deportation, she finally did report her husband and began counseling with REACH Beyond, a program for abused women. Following the rally, the crowd made its way through Boston streets to the John F. Kennedy Federal Building, where they laid dozens of white carnations in tribute of the families broken up by deportations. Massachusetts is home to nearly 200,000 immigrants here illegally, which costs the state roughly $2 million a year, according to a 2010 estimate by the Federation for American Immigration Reform. A representative for Boston Mayor Thomas M. Menino promised his support for their fight for immigration reform, noting that Menino is the son of Italian immigrants. Those in attendence stressed that an immigration policy focused on deportations needlessly breaks up family units and punishes children who did not choose to come to the country. They carried signs that read “Roadmap to Citizenship NOW” and chanted “Stop deportation, reform immigration,” as they processed down the street. “It’s heartbreaking any time a family is torn apart,” said Ciara Lavery, a 33-year-old immigrant from Ireland who spent more than a decade living in the United States illegally before becoming documented.